Ah, the evergreen fishtail braids. In the world of hairstyles, you can’t survive if you haven’t seen and tried at least the simplest of braiding tutorials: fishtails. And there’s absolutely nothing about this fishtail braids that I don’t love: glam on the sides and sleek and polished all over. With this neat look, it is proven again that this braided hairstyle needn’t be super-boring and works well with both short or long and even with straight or curly hair. Not to brag, but I am pretty good with the braids. I make sure I invest my time online, learning how to braid with the help of YouTube videos like I have been doing it since birth. Or maybe I actually had no idea until I read a post on fishtail braid a while ago. But whatever it is, I love braids, and if I want a new style, I am going to find one anyway, even if it is the simplest of them all. In this hairstyle, you can even braid at the back. As I have bangs, I prefer braiding it on one side. It’s also better to make a side swept braid if you are a beginner as it may be a little difficult to create this starting from the back. Once you learn the technique, it is very easy and quick to do. Got simple long hair? Give it a touch of front bangs. 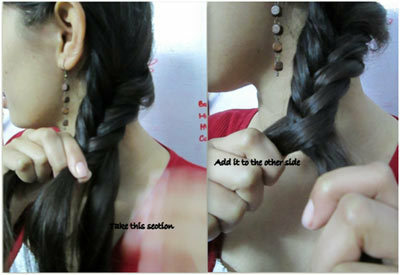 Now add glamor and style by doing a normal but messy fishtail braid. Tie up a bow and leave some hairs on the other side to hang loosely. You will love this sweet look. This half up and half down fish tail braided pony is a must try on as it is easy to do and sport. Can go pretty good with normal sleek hair or a messy hair as well. Got thick medium length hair? Try this side braided fishtail on. Perfect for a First date, or a romantic candle light dinner. Try pulling your hair in from all sides, Go twice left to right and right to left, take the ends in and tie in a pony. Secure with pins to get this awesome jazzed up yet a very formal braided look. A side dragged fishtail pony can be wrapped and secured around the head in form of a head band. Do not worry about the messy feel. It will only add to the glamor. A messy relaxed look, easy to do and just as awesome to sport. A grand favorite for the Red Carpets. If you have thick hair, which is long enough for a jazzed up fishtail braid, and then try doing a fishtail braid either from one side or from the absolute end point of your head. 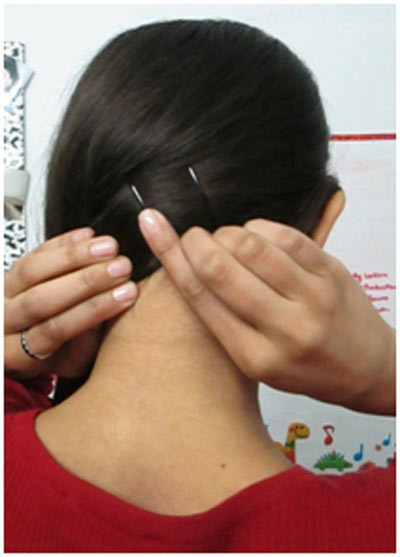 Wrap around the head in form of a head gear .Keep securing with hair pins and bobby pins as you go on wrapping it around. A classy look. Can be great if you know how to do French twist pony tails then this should come easy to you. A very different look with 3 different twists. Do a loose start for a pony with a conch shell beginning and tie the forefront of it. Now do a tight fishtail half up half down braid and secure the braid to form a pony tail. Cool isn’t it? Do a low hung tight fishtail pony and you are good to go. A classic “on the road” look and a great hairstyle for a live rock show. And this is why we all love braids! If you wish to go for a messier look, then pull the braids apart to make it more dynamic, otherwise you can leave it as it is. Also, it is completely fine if there’s a bump or a knot, it will add to the absolutely cool texture. Step 1: If you don’t have smooth hair, begin with preparing your hair with a paddle brush and Bamboo Smooth Anti-Humidity Hair Spray to get that silky smooth look. Now, comb all your hair to one side and pin them up with bobby pins, this will keep your hair tight. I usually do on the opposite side of the bangs. For that romantic touch, you can even leave some wispy tendrils on one side. 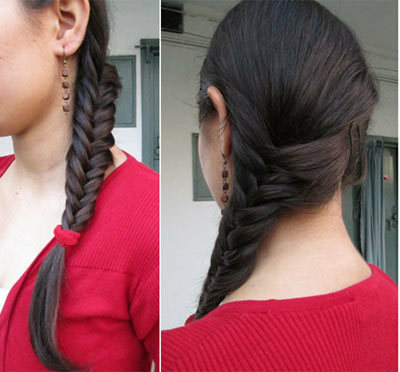 Step 2: To start with the fishtail braid, divide the hair into two equal sections – also happens to be a genius trick for side-braiding – now as shown in the picture below, take a small segment of your hair from one side (take the segment from the back) and start pulling them into the plait your hair until you reach your neck. Tip: To avoid tangling, keep your hands separated during the plaiting. Step 3: Now repeat the same steps on the other side. Take a small section of hair over the half and add to the other side. 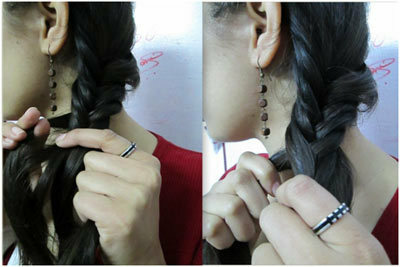 Hold the braid tightly and repeat the above two steps alternately. Step 4: Secure it with a rubber band. Keep one thing in mind that the smaller the sections you take the prettier the braid would look. You can keep it very tight to give a neat look or keep it loose to give a messy look. Once done, add some texture by spraying your braids with a hairspray, like that of Kerastase Double Force. Now there are many styles of fishtail braids some of which are easy and some not so easy. But all are good for not just evening occasions but also for formal parties. Even as an office hairstyle this can be a total show and a great change from your regular ponytails. And, how cool are these side-swept fishtail braid? The style is easy to create and maintain, and once you perfect it you can rock this braids anywhere you go and with any outfit. Do let us know your thoughts in the comments section below!